Cheerleader-OMI | Wedding Wisdom, Etc. 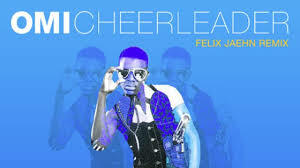 “Cheerleader” is a terrific Calypso-style song by the artist Omar Samuel Pasley, whose nickname is Omi. Te song always manages to get people up dancing at every party, and makes my trumpet player extremely happy. It’s actually rare to hear a solo trumpet part running throughout an entire song. It’s a very simple song, relying almost exclusively on it’s percussion-infused Caribbean beat. Most guests are unsure exactly how to dance to “Cheerleader,” but it’s hard to hear it, and not at least be captured by its infectious groove. The lyrics, unsurprisingly, are trite, and more than a little bit objectifying of woman. But like so many dance songs on this blog, the lyrics are fairly inconsequential. They become a lot more obvious and sexist when you watch the video. But what the hell. It’s really a fun song to play, and gratifying to watch people enjoy dancing to. Here are some of the lyrics. And they say, do you need me? But I’m empty when you’re gone. “Cheerleader” really is a fun dance song. Get up and dance. Leave a comment to let me know how you feel.